Captain Chesley Sullenberger engaged in an emergency landing with a plane full of 145 passengers after a flock of birds disabled both of his engines. Everyone on the plane survived and Sullenberger has been heralded as a hero, making special appearances at the Super Bowl and fielding phone calls from the likes of President George W. Bush. 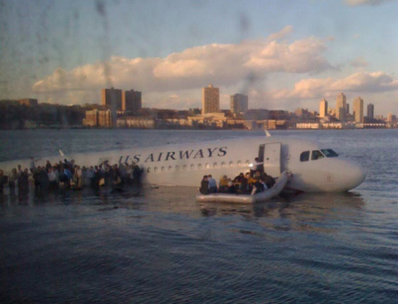 What is fascinating to everyone about this story is Sullenberger’s remarkable calm as he decided to land an entire commercial plane in a New York City River. It’s not as if that was standard US Airways protocol, but he seemed to do it with grace and ease. It was his calm and confidence that really set apart Sullenberger as a true hero. We know that, had we been in his position, the outcome would have been different. I personally would have panicked, hesitated, second guessed myself, and made multiple mistakes, not the least of which would have resulted in a significant loss of life. Clearly Captain Sullenberger was cut from a different mold than the rest of us. The reason I mention this story today is because it’s a great illustration of the Christian life. More specifically, it reveals the key to making good decisions at important moments. You see, we look at Sullenberger and we’re amazed that he could make this seemingly spontaneous decision that turned out so well, but it wasn’t really that “spontaneous” at all. Sullenberger had been training for that moment all his life. Sullenberger got his pilot’s license at the age of 14, he flew fighter jets in the Air Force, he investigated air disasters, he mastered glider flying, and he even studied the psychology of how cockpit crews behave in a crisis. As reporters checked into the life and background of this man, they discovered that he’d devoted his entire life to the practice of flying. He had pursued every aspect of the discipline with excellence. He had trained his body and his mind to know the art of piloting planes, inside and out. So when the time came to make an emergency decision, he didn’t even hesitate. He knew exacty what to do. By then it was all second nature. This, in many ways, is the story of the Christian life. We think that the big decisions we make in life are the moments that define us. That is not the case. Those moments only test our mettle; they reveal our true character and what kind of person we’ve become. It’s what we do in between those big moments that truly define us. So many people come to a fork in in the road of their lives and they have no idea which direction to turn in. Whether it’s choosing a job or dating a particular person, they can’t seem to discern God’s will. No matter how hard they try they can’t get clarity, and they are mystified by the difficulty of it. But those same people often neglected to spend time communing with God and learning to discern His voice every other day of the year. It is no wonder they don’t recognize His leading–they haven’t trained themselves to follow it. As Christians we must be like Captain Sullenberger, who used every opportunity to mold himself into an excellent pilot. When the time came to make a decision, he responded like any thoroughly-trained pilot would–with confidence and certainty. Similarly, the key to discerning God’s will in the big things is becoming a person who follows God’s will in the small things. Spend time reading the Bible, make time for prayer, use each day to seek God and know Him better. Then when a big decision comes along, you won’t respond like a rookie pilot might have responded that fateful day in the New York skies. Instead, you’ll know exactly what you need to do. The question you have to ask yourself is “Who am I becoming?” Are you crafting yourself into someone who can recognize God’s will, or are you living each day for yourself, only calling on God’s help when you think you need it? It’s all in how you spend your time TODAY. It may not seem like much now, but every one of those tiny steps of preparation made Captain Sullenberger the pilot he is today. History would be different had he not. * I must give credit to Dr. Samuel Wells, the Dean of the Chapel at Duke University, for directing me to this illustration. I recently heard him lecture and he referenced this story in his message. I thought it was excellent so I decided to use it here. Thanks you for sharing!! This is the perfect illustration for an upcoming message on facing the unknown in life.